Transport for London’s (TfL) stress on low-height truck cabs and the Direct Vision Standard as the best means of ensuring vulnerable road users are not injured by tippers and other lorries is applying a 20th century solution to a 21st century problem. So says IVECO alternative fuels director Martin Flach. He observes: “It helps a bit, but if it were that effective then people in London would never be hurt or killed by buses or bin wagons.” Both types of vehicles have low driving positions with glazing all around. (There were 1,921 bus or coach collisions, compared to 3,326 for HGVs, according to TfL statistics for 2016, the latest year available: https://is.gd/mumohe). In Flach’s view, it is far better to mandate the installation of cameras, sensors and other safety devices that will alert drivers to a hazard, rather than relying on drivers eyeballing a cyclist who is getting dangerously close to their lorry, and responding accordingly. TfL argues that truck blind spots are a major contributory factor in collisions between trucks, on the one hand, and cyclists and pedestrians on the other, and that Direct Vision is intended to help address this. It adds that 23% of all pedestrian and 50% of all cyclist highway fatalities in 2016 involved lorries, despite the fact that they only account for 4% of the road miles covered in London. 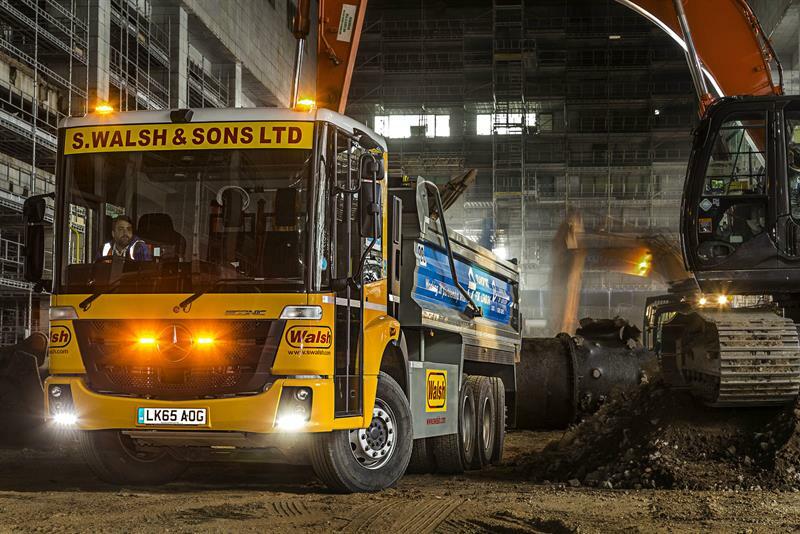 It is particularly concerned about traditionally designed six- and eight-wheel tippers because the under-chassis clearance and the angle of approach they may require to get on and off sites mean that they often sit higher on the road than other lorries. That makes it less easy for their drivers to spot people who may be at risk, it contends. Nor is a tipper’s ability to negotiate rough, uneven terrain as essential as it once was. These days construction sites install roads early on to ensure that tippers do not get stuck in the mud; so an ability to negotiate deep ruts may not be such a pressing requirement. TfL is grading Euro VI trucks grossing at above 12 tonnes from zero to five stars depending on how much a driver can see directly through the cab windows, with zero-rated models classed as being the most dangerous to pedestrians and bike riders, and five-star models the least hazardous. Zero-star lorries will be banned from London’s streets from 2020 onwards, unless they meet the requirements of a new Safe System (see link below). The threshold will increase to a minimum of three stars from 2024 onwards, with vehicles that fall below it excluded unless they are Safe System-compliant. To qualify for a Safe System permit, lorries will have to be fitted with the sort of safety kit Flach refers to. The details of what will have to be installed have yet to be determined and will be unveiled later this year, but seem likely to be in line with the requirements of the Fleet Operator Recognition Scheme’s Silver standard; so for some fleets it will be business as usual. “Basically what all this means is that operators should buy the truck they feel they need, and have it equipped with whatever extra gizmos TfL asks for,” says Flach. Aware that under-chassis clearance is not as imperative as it was, and sensitive to TfL’s concerns, some tipper fleets running regularly in and out of London have nevertheless opted for modified low-height refuse collection vehicle chassis. Sales of both Mercedes-Benz’s Econic and Dennis Eagle’s Elite have benefited as a consequence. As well as a low driver seat height, Econic can be specified with a top-to-toe bus-style bi-fold glazed passenger door which gives the best possible nearside vision, says product manager Rupert Barnard. “That’s the one most customers opt for,” he observes. Power comes courtesy of a 345bhp diesel that can now be married to a 12-speed PowerShift 3 automated transmission. Previously the sole choice was a six-speed Allison fully automatic box, reflecting the truck’s bin wagon heritage. While 345bhp may seem somewhat meagre for 32t gvw tipper work, Barnard says that he has received no complaints about a lack of power; probably because the trucks operate in a stop-start urban environment. “They’re not constantly running up hill and down dale,” he observes. While Flach makes the point that manufacturers cannot be expected to design models to meet the requirements of individual cities – no matter how large or important they may be – other lorry builders have been introducing low-height cabs which should appeal to TfL. Late last year, Scania announced the availability of the L-series cab. It can be ordered with automatic kneeling to give a single 440mm entry step on both the driver and passenger side, and a cab floor height of around 800mm, depending on tyre choice. If automatic kneeling is not specified, then a second boarding step is fitted giving a cab floor height of approximately 930mm. Three roof heights are offered and a passageway in front of the engine tunnel links the driver and passenger areas of the cab. Somewhat surprisingly, the L-series is not initially being offered with the 7-litre diesel, which is about a year away. Instead it has been combined with the updated 9-litre, available at 276bhp, 316bhp and 355bhp. The 9-litre gas engine has also being added to the line-up at both 276bhp and 335bhp. All the engines can be married to either Opticruise or a fully automatic Allison gearbox. The cab has an option of factory-fitted City Safe low-positioned passenger door window. Not to be outdone, Volvo has recently widened the appeal of its FE LEC (low-entry cab) with a version designed for a driver and a single passenger – one that might appeal to tipper firms – available alongside the four-seater version designed for bin wagon crews. Due for 2019, Volvo’s new FE Electric will be marketed with a LEC: a combination that is sure to guarantee TfL’s gratitude, given its concerns about emissions as well as safety. In tipper guise, Econic can be ordered at 18 tonnes, at 26 tonnes and as a tridem 8x4 32-tonner with a rear-steer axle. In fact it can be ordered as a 4x2, a 6x2 or a 6x4, as well as in 8x4 guise. Also available is an axle-loading indicator system – the front axle’s maximum load is 8 tonnes – and air suspension on all its axles for a 160mm rise and 50mm fall. The low chassis frame comes with a full-length uninterrupted hole pattern spaced at 50mm intervals, plus an adjustable rear cross-member to make body design and installation simpler. Wiring for the body can be installed through an empty pipe leading from the frame into the cab, and a plug and play interface is fitted to make connecting easier. Reinforced anti-roll bars are also available for bodies with a high centre of gravity.